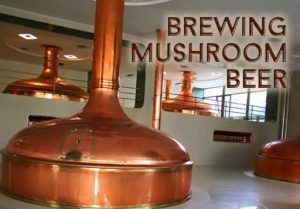 Brewing mushroom beer at home can be fairly easy once you know what to do and how to do it. Beer lovers have long been touting the wonderment of craft beers. Now it is the humble mushroom that is making its way into beer as an ingredient. While subtler than chili or chocolate, its flavor blends well with different beer brews. Mushrooms are not the first thing you think of a nice cold beer. In fact, it sounds rather disgusting. But, according to those with refined beer tastes, do not knock it until you try it. Adventurous beer brewers are using mushrooms to create wondrous new craft beers. These could be the next best thing you create to drink. Most mushroom beers aim for subtle earthy undertones in a well-rounded, rich and savory beer. They infuse delicate flavors into the liquid while balancing the sugars and develop the richness of the malts. No two mushroom beers are the same. No matter how hard you may try even using the same ingredients. The delicate flavors from different mushrooms types all leave their own mark on different beer types. Some leave a lingering sweetness behind while others hit hard with powerful flavor. Brewing Mushroom Beer is fun and challenging. It more for seasoned brewers. But the younger generation is very interested in brewing mushroom brews and even magic mushroom brews which are more challenging. It’s very difficult to maintain the proper psilocybin dosage and even more difficult to get the psilocybin into the beer without losing it’s potency. So, let’s explore the world of beer fungi and continue reading our latest mushroom brewing articles. You still have so much more to learn.